g-ASTRONOMY is a collaboration with experimental chefs Jozef Youssef and Stefano de Costanzo, of London-based Kitchen Theory, two trailblazing chefs devoted to multi-sensorial dining experiences. g-ASTRONOMY aims to break the assumption that astronomy and astrophysics can only be understood in terms of visual representation. Instead, we wish to create simple, elegant (and edible) metaphors for some of the universe’s most complex ideas, so as to enable people to engage with some of the most important theories in astrophysics in a new, accessible and delicious way. 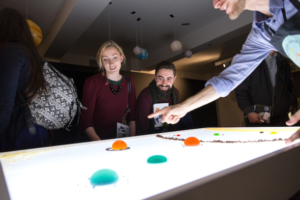 The collaboration produced an edible orrery of the solar system, with visitors of London’s Science Museum invited to create their own edible planets with a technique called “spherification”—producing liquid spheres encapsulated in a thin membrane that would burst in your mouth in an explosion of taste.The g-ASTRONOMY project is about using all of our senses to better communicate complex ideas in astronomy and astrophysics. It’s been an absolute privilege to be able to work with people with sight loss to better understand how to take the concept forward. Their insights and feedback will shape the next phase of g-ASTRONOMY: moving away from edible tableaux of astronomical ideas, and exploring deeper analogies in terms of the physics at work both in the Universe and in the kitchen.